The hype is real. Nintendo is getting it done and they're reveling in the marketing machine, just the way they should. Nintendo Enthusiast is reporting that Mario Kart 8's limited edition bundle has sold out at GAME's online store in the U.K., as well as Nintendo's online store, as indicated by the main image above. Utilizing the Wii U's secret sauce, Mario Kart 8 prepares gamers for excellence, housing 32 amazing tracks, half of which are completely remade fan-favorites from the history of the franchise, designed to take advantage of the brand new racing mechanics and online multiplayer. That's right, for the first time in the history of the Mario Kart series, you'll be able to play Toad's Turnpike online, with friends (or foes) with full customizable vehicle support and the brand new anti-gravity feature. Did I happen to mention that the game looks absolutely gorgeous? Well it does. The game's graphics have been lauded so much that even members of the Doritocracy have mentioned that Mario Kart 8 is one of the best looking games of the eighth generation of gaming, calling it stunning and fierce. Makes all those arguments about the system being underpowered look a little flimsy, no? But all of that is to say that the features, the content, the pricing, the graphics, the nostalgia and the awesomeness have come together into a pot of excellence that has propelled the sales of Mario Kart 8 above and beyond our expectations. The game has already become the Wii U's best selling item on Amazon and is continuing to make the PS4 weak in the knees. Also, as pointed out by Nintendo's World Store Twitter account, the game's bundle packs are selling out everywhere. 1/2Thanks to our dedicated fans for making the #MK8 limited edition bundle the fastest selling item at #NintendoWorld! 2/2We sold through our pre-orders but will have more for walk-ins while supplies last starting 5/29 at our launch event! Take note that they mention “sold through” and not “sold in”. That means that customers are buying these things up left and right, and they're not just being sold into inventory at e-tailers and retailers alike. 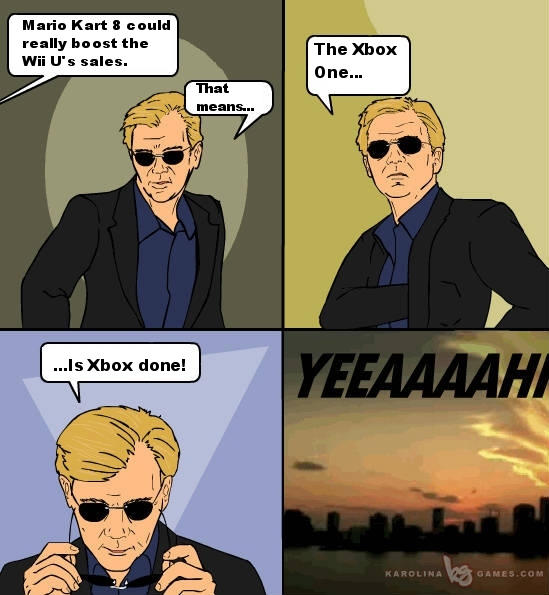 At this rate the Xbox One will be left in the sales dust like American privacy rights under the NSA's spybox regime. Nevertheless, excellence awaits at the end of this month as Mario Kart 8 drops exclusively for the Wii U.